Anna’s Griffin Doseck drives against Clark Montessori’s D’Shawnti Hawkins during a Division III district final on March 10 at UD Arena. Doseck was named first team all-Ohio in Division III. 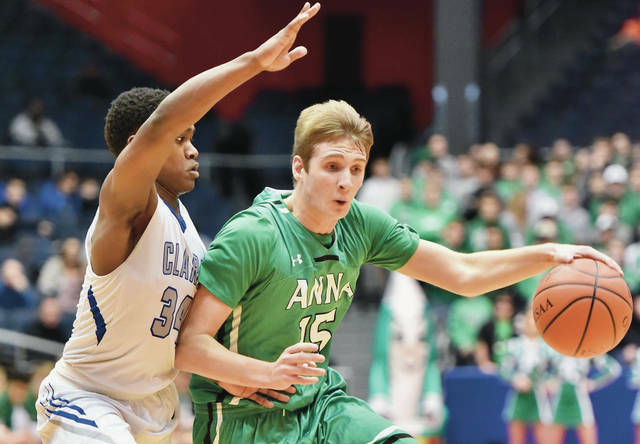 Anna’s Griffin Doseck has one last item to add to his list of accolades from his senior season. Doseck, a senior forward, has been named first team all-Ohio in Division III. The Ohio Prep Sportswriters Association released Div. III and IV all-state teams on Tuesday. Selections are based on regular-season performance only. Doseck averaged 15 points, 7.5 rebounds and 2.6 assists per game for Anna in regular season. He also averaged just under two blocks per game. The Rockets, which lost in a regional final to Cincinnati Purcell Marian last Saturday, were 20-2 in regular season and finished 25-3 overall. Doseck was named the Shelby County Athletic League’s player of the year and was also named Ohio Basketball Coaches’ District Nine D-III player of the year. Several Jackson Center, Fort Loramie, Russia and Minster players earned special or honorable mention recognition in Div. IV and a Versailles player was named honorable mention in D-III. Jackson Center’s Trent Platfoot was named special mention in Div. IV. Platfoot, a senior guard, averaged 12.5 points, 3.8 rebounds and 2.5 assists per game. Minster’s Jarod Schulze was also a special mention selection in Div. IV. Schulze, a 6-foot-9 senior center, averaged 14.5 points and 7.2 rebounds per game. Versailles’ Michael Stammen was named D-III honorable mention while Jackson Center’s Aidan Reichert, Fort Loramie’s Nick Brandewie and Russia’s Daniel Kearns were honorable mention in Div. IV. Stammen, a junior guard, averaged 15.4 points, 3.7 assists and 3.2 rebounds per game. Reichert, a 6-4 sophomore forward, averaged 14.5 points, six rebounds and 2.4 assists per game. Brandewie, a junior guard, averaged eight points, 2.4 rebounds, 2.4 assists and two steals per game. Kearns, a 6-5 senior forward, averaged 11.4 points, 6.8 rebounds and 2.4 assists per game. Division I and II all-state teams will be released on Wednesday by the OPSWA. Mr. Basketball will be announced on Thursday. The OPSWA took over coordinating all-state and all-district teams in 2017 from the Associated Press, which greatly reduced its coverage of high school athletics nationwide that year. The OPSWA has media panels that select all-district teams for each of the OHSAA’s six districts. A statewide panel selects all-state teams based on first and second team all-district selections. Complete Div. III and IV teams are below. Player of the year: Christopher Anthony, Canal Winchester Harvest Prep.